The county seat of Lake County in central Colorado, Leadville is a small statutory city situated right among the Rocky Mountains. Nicknamed 'The Two Mile High City' and 'Cloud City' due to its extremely high elevation, Leadville is a popular tourist hotspot but houses around 2,700 people. The city of Leadville covers an area of just 1.1 square miles, but was once the second most populous city in the entire state of Colorado. The history of Leadville is very interesting. When the Colorado Silver Boom began, a couple of mine owners founded the town of Leadville in 1877. Due to its prime mining location, Leadville thrived, with several churches, hospitals, banks, and a large school being quickly constructed. Mining was extremely successful for many years, with Leadville contributing hugely to the state's economy. The city was also known for gunfights and lawlessness and was a very lively location for a long time. However, when mining died down, Leadville suffered the consequences. A mass exodus of the city took place, leaving a much smaller population than before. In the modern era, Leadville relies mostly on tourism and its status as such a highly elevated and historic city to draw people in, organizing annual sporting events like the Leadville Trail 100 ultramarathon and opening up the National Mining Museum and Hall of Fame to pay homage to the town's history. Elevation is the geographical term used to denote how high or low a place is in relation to sea level and is very important for a variety of reasons. Elevation can, for example, influence an area's climate. The elevation of Leadville, CO is particularly interesting as this city is the highest of its kind in all the United States. Leadville has an elevation of 10,152 feet (3,094 m), which is immensely high up and helped the city earn its aforementioned nicknames. 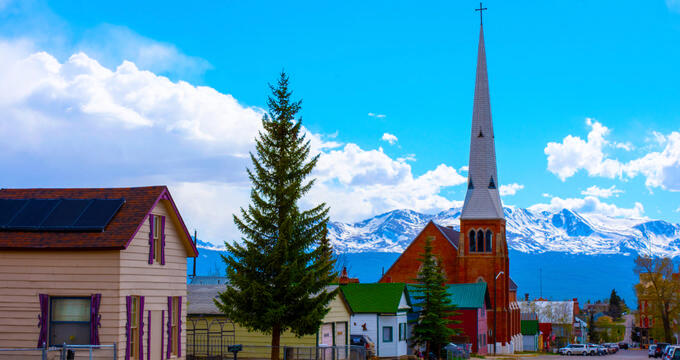 Leadville’s 'Two Mile High City' nickname is a reference to Colorado's state capital, Denver, which has an elevation of 5,280 feet (1,609 m), which is approximately one mile. Leadville isn’t exactly two miles up in terms of elevation, but it is extremely high. A few other settlements around the United States can be found at higher altitudes, but Leadville is the highest incorporated city. Its high elevation is due to its location among the Rocky Mountains, and its elevation of 10,152 feet (3,094 m) is very close to the tree line, which is the elevation at which trees are no longer capable of growing due to the difficult conditions. In Colorado, the tree line begins at 11,000 feet (3,353 m). Colorado cities have high elevations in general as the state has the highest mean elevation of all with 6,800 feet (2,070 m). The highest point in the state is Mount Elbert, which is actually located barely 16 miles away from Leadville and has an elevation of 14,400 feet (4,401 m), while the lowest point is the Arikaree River, which has an elevation of 3,317 feet (1,011 m). Leadville is much higher up than major cities like Colorado Springs, which has an elevation of 6,033 feet (1,839 m) and Aurora, which has an elevation of 5472 feet (1,668 m). The city of Leadville has an alpine subarctic climate due to its extremely high elevation and location among a mountainous region. The city has relatively cold temperatures even in the warmer months and can drop below freezing point for the majority of the year. The hottest month of the year, July, has average highs of 72°F (22°C) and lows of 38°F (3°C), while the coldest month, December, has highs of 31°F (-1°C) and lows of 4°F (-16°C). Some rain can fall in Leadville all year long, but the city's main form of precipitation is snow, with up to 150 inches falling annually. Leadville is only a small town but still has a lot to offer, relying on tourism to stay afloat. Its status as the highest city in all of the United States is a big draw for many tourists, with a lot of people wanting to take photos and see the views from this location. Leadville is also a good base for anyone looking to explore the Rocky Mountains, and it has its own unique attractions and events like the National Mining Museum and Hall of Fame. Due to its high elevation, Leadville can cause altitude sickness in visitors, resulting in shortness of breath, headaches, nausea, and more, so it’s vital to be prepared when planning a trip to Leadville, CO.